by Ellyn of Rabbit Smarties Publishers. Let’s start our study of rabbit coat color genes with the A genes. Genes in the A series don’t change what hue the rabbit is, but they affect the arrangement of the color pigments. There are three possible forms. We often call the A series the “agouti series”, because Agouti is the so-called normal form of the gene. The “A” gene comes in three forms: “A,” which is responsible for agouti rabbits; “at,” which is responsible for the tan pattern; and “a,” which is responsible for “self” colored rabbits. Although there are three possible genes, each rabbit can only show one and carry one. From left to right: Agouti Pattern, Tan Pattern, and Self Pattern. 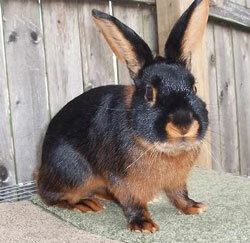 Specific colors: Chestnut, Black-and-Tan, and Chocolate. The Agouti pattern is the wild rabbit pattern. It’s the lovely interplay of color pigments in their original form. You can tell if you have an agouti patterned rabbit, if it has dark hairs, called “ticking,” interspersed among their lighter middle coat. The base of the hair shaft is dark, causing rings of color to appear when you blow into the fur. [Note: non-extension agoutis such as creams and oranges do not have dark undercolor.] Agoutis have light cream to white markings on their undersides: the belly, chin, inside of the legs, and bottom of the tail. You can also identify them by the dark lacing around the ear tips, and white circles around the eyes and nostrils, and white insides of the ears. The agouti pattern is the most dominant genetically. Examples include chestnut, opal, lynx, orange, chinchilla, steel, and many more. A rabbit that shows the agouti pattern may carry one of the two lesser genes without showing it. The next level down is Tan Pattern, symbolized by the gene at. You can identify tan patterned rabbits because they are a regular self color on the top — like black, blue, chocolate, lilac, Siamese sable, or tortoise — and have lighter markings underneath, like agoutis. 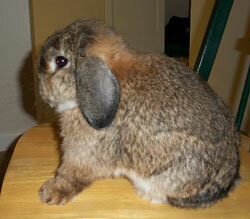 Tan patterned rabbits do not have ring color or ticking on the topside of the body. Examples include otter, silver marten, sable marten, “tort otter,” and of course the Tan breed. A tan pattern cannot hide agouti, but it can hide the self gene. The third gene in the A series is the self gene, which we indicate using the small letter “a”. Any rabbit that shows a self color has the genotype of “aa,” because it cannot hide agouti or tan pattern under it. In the show world, “self” means one single color all over, like black, blue, chocolate, and lilac. When we’re talking genetics, the definition of self is slightly different. In addition to black, chocolate, blue, and lilac, self colors also include tortoise, Siamese sable, sable point, smoke pearl, and other unrecognized varieties. Although some genetically self rabbits have some shading, a genetically self rabbit will never have agouti or tan pattern markings. There’s lots more to learn! Check out the next article to learn what happens when you breed these genotypes together! Also, if you missed our Primer on Rabbit Color Genetics, you might want to check that out first! Also, Using Breeding Squares to determine the outcome of your litters.